One of the great entertainment phenomenons is 'Holiday on Ice', the largest live touring production in the world. The latest tour, featuring a new show called 'Romanza', uses for the first time a central sound reinforcement concept delivered by Camco. As usual, the show is a mixture of professional figure skating, colourful costumes, music and spectacular light effects. From Romeo and Juliet to Carmen, Caesar and Cleopatra, the audience is taken through a kaleidoscope of classic love stories and dreams. 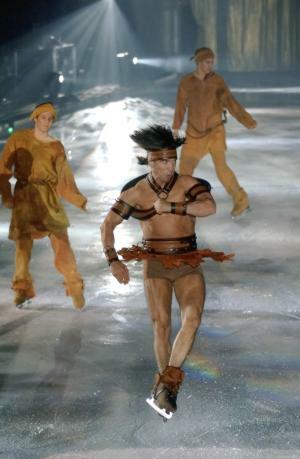 The choreography comes from Olympic figure skater Jamie Isley and the show is directed by Frank Wentink. The show premiered in Hamburg's Color Line Arena, launching the 'Passion Tour 2005/2006', which will ultimately comprise around 1700 performances in over 80 cities and 20 countries. Music and language make up a significant part of the show. So when it came to choosing the PA, attention had to be paid to how clearly the spoken word was transmitted, in addition to overall sound quality, and the size of the system for trucking. Leo van den Boogaard, the tour's sound designer, and Camco's Reinhard Steger worked in close co-operation to put together the sound reinforcement concept. "Romanza is the first Holiday on Ice production to use a central sound reinforcement concept," says Leo van den Boogaard. "This provides us with quite clear benefits. Reducing the number of sound sources saves an awful lot of time in setting up and taking down the equipment. The sound equipment is so compact in size that transport volume was cut by almost half, while sound quality both for audience and performers improved dramatically." In special courses tailored to the show's specific requirements, Reinhard Steger provided the sound crews with dedicated training for using the new system. The tour will be using up to 38 Nexo Geo S805s plus six Nexo Geo S830s, which, under normal circumstances, will form two main hangs and two out-fills. Up to eight Nexo CD18s will provide a solid bass foundation, while up to 12 Camco Vortex 6 amplifiers will provide the drive. Also being used is a Camco WinCai system, which will enable the sound engineer to control the whole system and monitor the amplifiers and controllers comfortably by computer from his FOH position. Speaking after the premiere, Bogdan Lewko, technical director of Holiday on Ice said, "the PA will be used for both large and small venues. The conditions we have to deal with often provide a challenge, as many halls are built of steel and concrete. However, the outstanding capability of the new system means that a central aspect of our show, the language, can always be understood perfectly. We are very happy with our decision to choose Camco and Nexo The support from Camco, especially from Reinhard Steger, has been excellent. They didn't simply want to sell, they wanted to provide us with the best possible solution." © 1997 © 2006 Pro-Music-News. All rights reserved. Thank you for visiting Pro-Music-News.